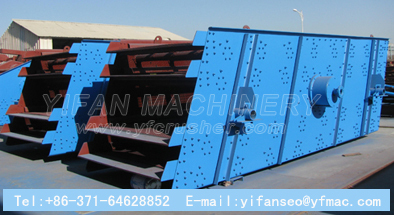 YK Series incline vibrating screen absorbs Germany technology with high efficiency. The amplitude of the vibrating screen can be adjusted. The screening line is long and specification of materials is various, and it is also of reliable structure, strong exciting force, high screening efficiency. It is widely used in sieve different sizes of aggregate. It is also applied to coal dressing, ore dressing, building material, electric power and chemical industries. The motor makes the exciter swing rotate speedily through the tire coupling. The continuous forced circular motions of sieve box were achieved through the powerful centrifugal force. Under the influence of sieve box, the materiel are tossed forward successively on the mesh. they were classified as thrown up, and the particals smaller than the mesh size were sieved out when they are falling, so that the classification of material could be achieved. Inclined vibrating screen is composed by sieving box, mesh, vibration exciter and damper spring ect. the vibratory screen adopts the vibration exciter with barrel type of eccentric shaft and block to adjust the swing. The vibration exciter is installed on the lateral plate of the sieving box. The motor makes the exciter swing round speedily through tire coupling. The continuous forced circular motions of sieve box were achieved through the powerful centrifugal force. The lateral plate made by the high quality steel plate withour any welding point. The lateral plate, beam and the vibration exciter connected by the high strength bolts and ring-grooved lockbolts. 1. High vibrating force with unique eccentric structure. Adopt advanced construction, making the vibrating force powerful. 2. The beam and case of the screen are connected with high strength bolts without welding. 3. Simple structure, easy to repair. 4. Adopt tire coupling and soft connection makes operation smooth. 5. High efficiency, easy maintenance, sturdy and durable. Inclined Vibrating Screen should start when there is nothing on the screen surface, and should avoid start the machine with materials, when the material running steady, then can feed. Stop feeding before stop the machine, and keep there is no material on the surface then stop the machine. Observe the operation of the machine when it is running. If there are abnormal movement or unusual sound, we should stop the machine and examine it, find the causes, and eliminate the troubles.